Here at Gaia Spa we offer a relaxing and nurturing place of well-being and calm where all our guests have the freedom to spend the time they need to rejuvenate and to feel taken care of. At Gaia Spa our policies are designed to ensure guests can escape the stresses of modern living and completely embrace the Gaia Spa experience according to their needs. Please take a moment to read our policies ahead of your visit to Gaia Spa. Gaia Spa is open 7 days a week, 365 days a year. Opening hours - The swimming pool, indoor heat experiences, hydrotherapy pool and gym are open between 6.00am and 10.00pm and treatments can be booked between 9.00am and 8.00pm. These hours are subject to change. We endeavour to keep all hotel and spa facilities operating during our opening hours but such facilities may be closed for private events, cleaning, decoration, repairs or any other reason beyond our control. Whilst we endeavour to minimise disruption to guests we have no liability to guests in respect of the same. 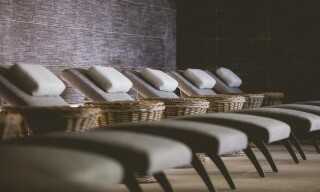 Hotel guests can use the spa between 12pm on day of check in until 12pm on day of check out – unless a late check out has been booked or you have a treatment booked for the day. You can book any treatment and upgrade your visit with a two-course lunch in the spatisserie for £25, or Champagne and chocolates for £15. Alternatively please view our day spa packages. Usage of the Spa facillities is free to any guests having a 60 minute or longer spa treatment. Guests having any spa treatment of 45 minutes or less can upgrade for £25 to use the Spa facilities. To upgrade any salon treatment to day pass £50. It is recommended that no alcohol is consumed immediately prior to your arrival and that you consume plenty of water following any treatments. Robes, flip flops and towels are provided on each visit and guests will be allocated a locker. In order to make the most of your treatment we would recommend that you arrive a minimum of 20 minutes prior to your first appointment as this will allow you time to familiarise yourself with your surroundings. Unfortunately if you are late for your appointment your treatment duration may be reduced and in this event there will be no deduction to the price charged. Treatment times include consultation and aftercare advice. There is a large car park at Boringdon Hall for spa guests to use free of charge. Please make your way to the Spa reception and you'll be greeted by a Gaia spa host who'll explain the procedures for your visit and guide you around the spa. Prior to your spa treatment we would advise changing into a bath robe and footwear that are provided to allow for maximum relaxation. It is advisable to wear underwear or swimwear underneath although we can provide disposable briefs if you prefer. Please be assured that all of our therapists are highly trained and your modesty will be protected at all times. Guests should dress for comfort in a t-shirt or vest with stretch trousers or shorts and trainers must be worn in the gym and for all fitness classes. Suitable swimwear must be worn at all times. Specific instructions for the use of heat experiences are detailed, please follow instructions for use and ensure you drink plenty of water. Guests are welcome to wear their robes in the Spatisserie. This is a sociable area for both relaxation and conversation and also an area for food and drink. A discretionary 10% Service Charge is applied to bills in the Spatisserie. No other service charges are applied as we believe this should always be at the guest’s discretion. Please note that the Spa does not retain any service charges, all monies are paid directly to the staff. The deep relaxation room is only available for guests to relax after their treatment; a quiet area and suitable for those guests wanting peace. Our inner sanctuary for private relaxation is also available to book in this area. Our spa environment is one of relaxation and tranquility. Please respect all spa guests’ right to privacy and serenity and we ask that you turn off your mobile phone whilst in the spa. In order to maintain a haven of tranquillity, children under 16 are not allowed to use the facilities at Gaia Spa. Please notify our staff if you are pregnant or have any special medical considerations so that appropriate treatment can be recommended. Kindly advise us of any health conditions, allergies or injuries, which could affect your treatment when making your spa reservations. Gaia Spa cannot be held responsible for any changes to treatments or cancellations that occur due to non-disclosure of medical conditions at the time of booking, however it's our ethos to help all people be well. We have experienced and highly trained therapists who will be happy to discuss any concerns you may have. Pregnant ladies are strongly advised against the use of any heat and or hydrotherapy facilities. Please notify our staff if you are pregnant or have any special medical considerations so that appropriate treatment can be recommended. Gaia Spa cannot be held responsible for any changes to treatments or cancellations that occur due to non-disclosure of medical conditions at the time of booking. However it is our ethos to help all people be well. We have experienced and highly trained therapists who will be happy to discuss any concerns you may have. Kindly advise us of any health conditions, allergies or injuries, which could affect your treatment when making your spa reservations. Gift vouchers are available for any treatment, day spa programme or product and are an ideal present for someone special. Gift vouchers are non refundable and must be presented to spa reception upon arrival. Full prepayment is required for all spa treatments. As a courtesy to other guests we ask that you provide 24 hours notice if you need to cancel or reschedule your appointment. If you cancel with less than 24 hours notice you will be subject to 50% of the treatment cost and if you give less than 12 hours notice you'll be charged the full treatment cost. If you wish to amend your booking in anyway, please contact us before you arrive. We cannot guarantee we will be able to accommodate any amendments to your booking. We always appreciate customer feedback as we look to continually improve our offering. Should you wish to discuss any aspect of your treatment or experience, we ask that you request to speak to our spa manager or head therapist prior to departure. In some cases we will follow up your visit with a phone call or email. Please make sure you have all your belongings when leaving the spa. We have a large range of retail products available to continue your experience at home. Please ask any of our trained team if you need any advice. Gaia Spa accepts no liability for any illness or injury resulting from use of the spa facilities. This includes over exertion or aggravation of a medical condition caused by such use. We recommend guests seek medical advice before undertaking any exercise or treatment. Gaia Spa reserves the right to maintain copyright of any photographs taken within our property. All photography or filming must be pre-authorised by a Manager of Boringdon Hall or Gaia Boringdon. Boringdon Hall and Gaia Boringdon do not permit press or blog reviews by members of the press, guests or members of the public without prior consent.